Preheat the oven to the highest setting and place a rack in the top half of the oven. Slice the peaches in half and remove the pit. Place in a baking pan cut side up, and drizzle half of the honey over the top. Roast for approx. 5 – 8 min. or until peaches are caramelized and slightly softened, but not mushy. Meanwhile, add the heavy cream to a bowl and whip with a hand mixer until soft peaks form, approx. 5 min. Drizzle in remaining honey and whip to combine. 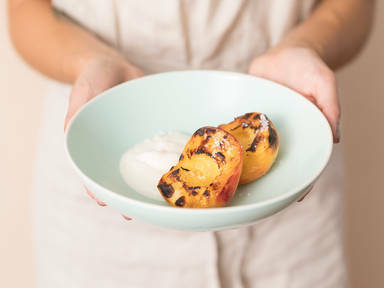 Add warm roasted peaches to a bowl with a dollop or two of the whipped cream alongside. Sprinkle with fleur de sel, if desired. Enjoy!